Thank you Naturally More for sponsoring this recipe. As always all thoughts and opinions are 100% my own. I’ve ventured into a lot of cooking being gluten free and plant based (vegan). 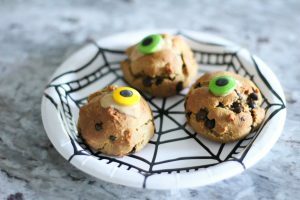 It’s pretty expensive to buy baked goods that are vegan and gluten free and they are not always easy to find. So what’s a gal to do? Well I decided to start trying out new things. I’ve had some failed baked goods and some victories. These chocolate chip scones are one of those victories. I hope you enjoy this simple recipe. Add all dry ingredients in a medium size bowl and mix. Add all wet ingredients and mix until it looks like cookie dough. Add parchment paper to a cookie sheet. Roll into small balls (should make approximately 8). Bake on 350 for 15 mins or until golden brown. Place on cooling rack and drizzly peanut butter on top of each scone. 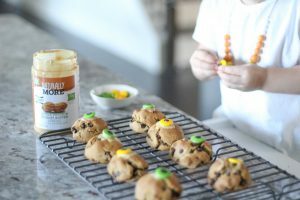 Add decor to the scone where peanut butter was placed. 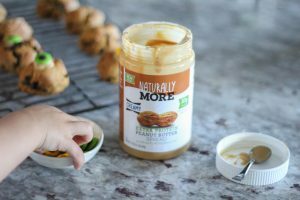 If you are looking for non gmo, gluten free, vegan, dairy free and no trans fat peanut butter than you should check out all the products at Naturally More. 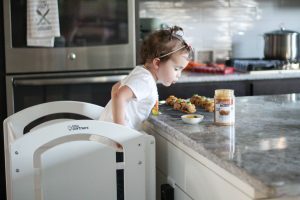 We have been using them for months now and Izzy enjoys the peanut butter in more than just her sandwiches. I LOVE all your vegan posts, keep it up! We’ll be trying these and i’ll tag you in them! Those are so cute!! and look yummy, too!! These are so fun, they look great!